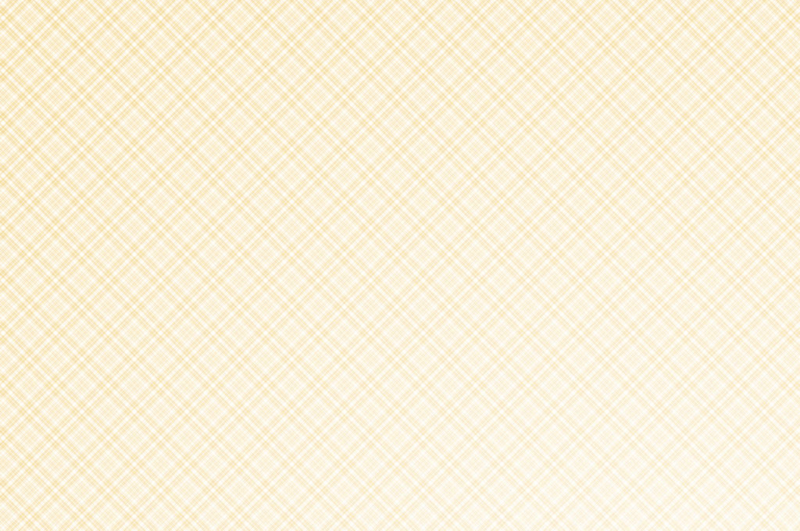 Welcome to Cat’s Cradle. 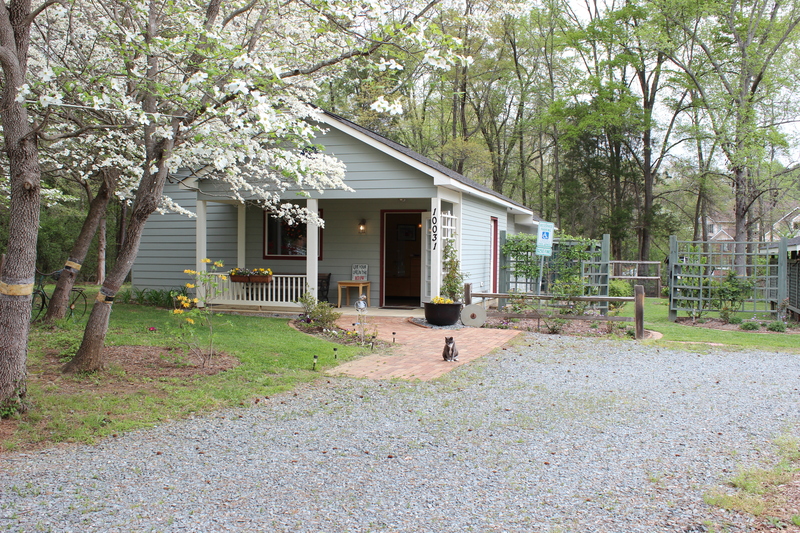 We are a boarding facility “for cats only” (sorry no dogs allowed) located in the Matthews/Mint Hill area of South Charlotte. Cat’s Cradle recognizes that your cats are more than just pets, they are members of your family. If you could create the perfect vacation for your cats, what would it include? 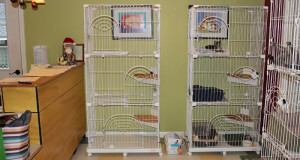 When boarding, your cat deserves and needs a homey and secure environment. Our large roomy suites feature windows with seating to allow your cat a view of the outside garden area, three levels of perches, a climbing tree, insulated floors and a temperature controlled environment. 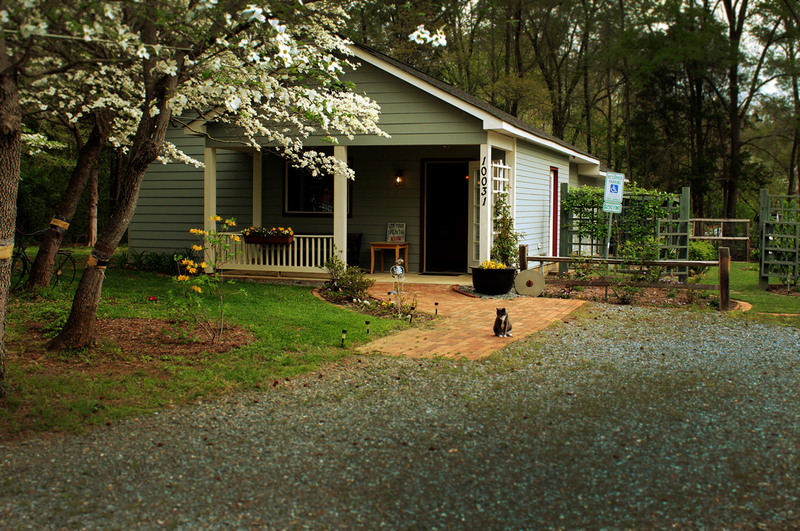 At Cat’s Cradle, we care for your cat as if it was our own. I am thrilled that I discovered Cat’s Cradle. The concept of “cats only” boarding is a brilliant idea. Taz, my nine year old kitty, loves it there. It is meticulously clean and almost Zen-like. The classical music played around the clock adds to the serenity of the peaceful environment. Taz stays in a “condo” with a window ledge where he can view the picturesque garden and the bird feeders. The host always welcomes Taz when he stays there and he feels right at home. Cat’s Cradle is the ultimate boarding experience! When I leave my cat at Cat’s Cradle, I always know that she is going to be well taken care of and loved. The individual “condos” are like the kitty Hilton! If I couldn’t board my cat at Cat’s Cradle, I wouldn’t be able to travel! There is absolutely no place like it! The Cat’s Cradle has been a God send for us. 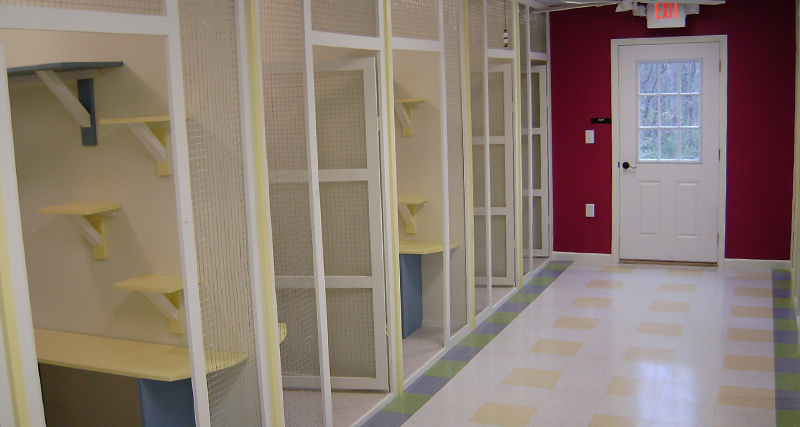 This “cat only” facility is spacious, and the cleanest facility we have ever seen! The hosts really care about your furry friend. That clearly comes across every time you drop off your cat. 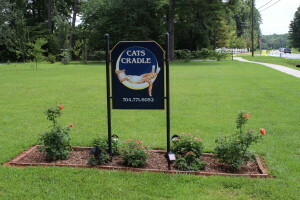 If you need a worry free place for your kitty, look no further than Cat’s Cradle, but be sure you make a reservation as this place fills up quickly. 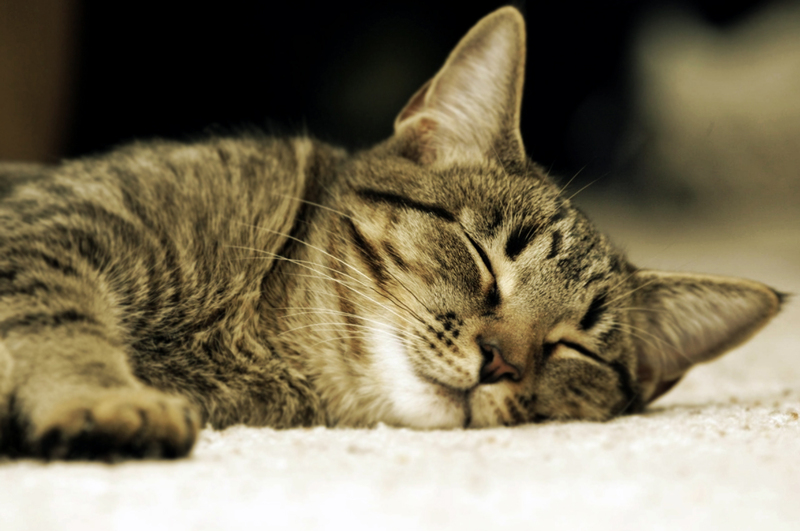 Making sure your pet is relaxed and comfortable is of the utmost importance to Cats Cradle. 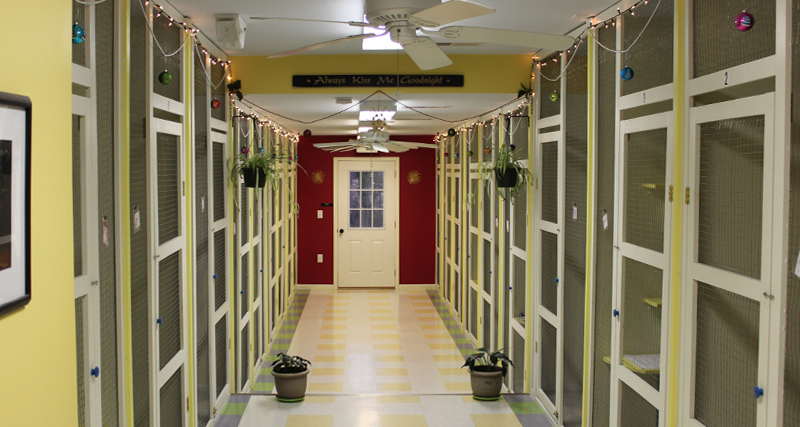 Insulated floors, climate controlled suites and soothing music accompany the personal attention your pet will receive during their stay. Cats Cradle wants our guests to stay fit and active while they are in our care. So we have included three levels of shelves, ledges and outcrops for cats that are comfortable up high. Climbing trees are also included to keep your pet on the move. 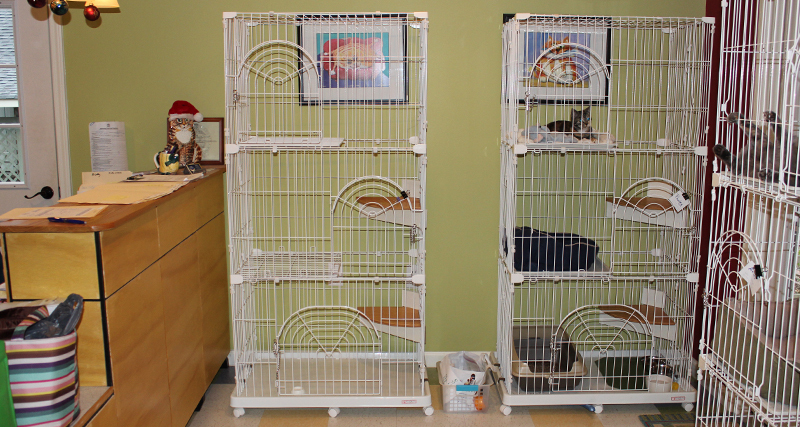 Instead of traditional cages, Cats Cradle offers oversized walk-in suites. 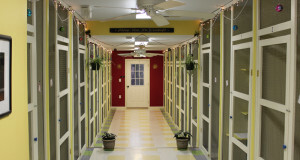 We have seventeen large suites that measure 4ft. x 8ft. x 8ft. high that can accommodate up to three cats. 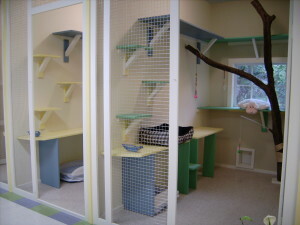 An additional two extra large suites measuring 5ft x 8 ft x 8ft high that can accommodate up to four cats. Six of the kennels have access to individual outside areas and we also offer overflow kennels if needed during the holidays. Cats Cradle was designed to offer our guests as much stimulation as possible. All suites have a window with a view of our gardens. 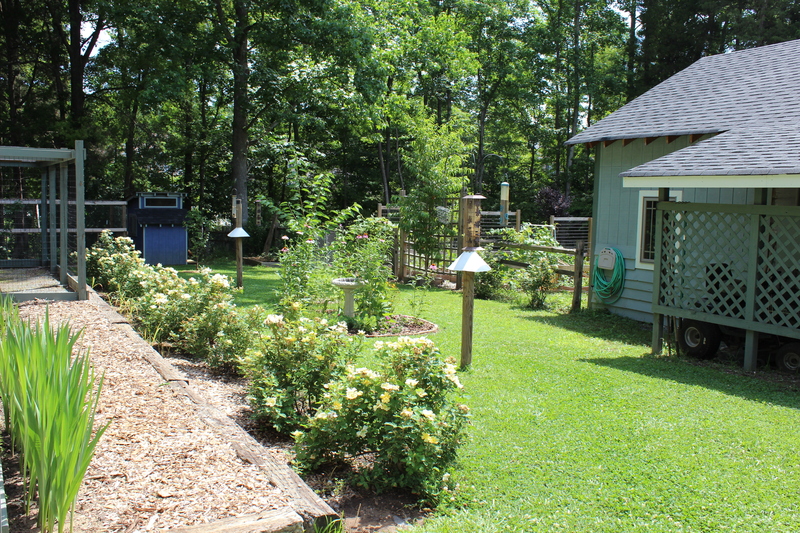 We deliberately chose plants that would attract the attention of butterflies. The cats spend most of the day on their window seats watching the birds at the 4 feeding areas in the garden. Cat’s Cradle does not offer discounts for extended stays. We believe that the longer the stay, the more attention the guest deserves and receives. We do offer active military and senior citizens a discount of 10% off the cost of a suite with one cat. 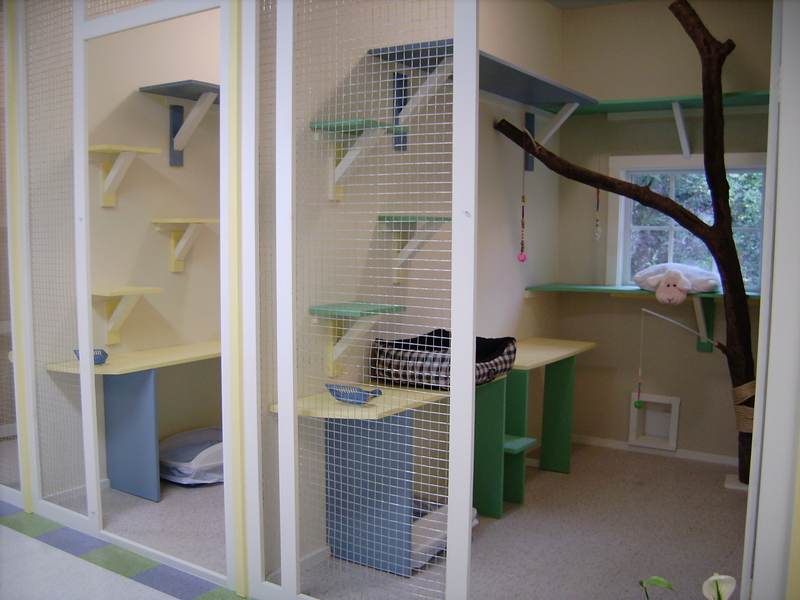 If you have decided to choose Cat’s Cradle for your cat boarding needs, please take a moment to review our policies for more information on booking a suite, health requirements, pet safety and what to bring. Please download and complete the forms below and bring them along when dropping off your pet. 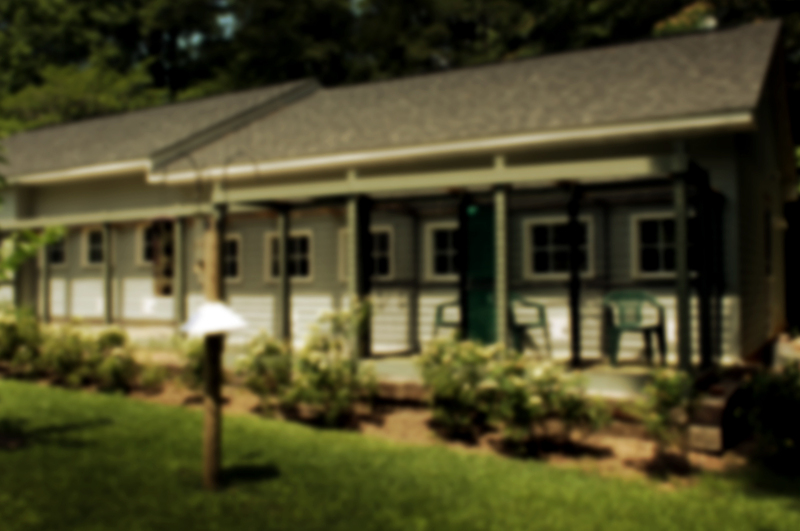 To provide a safe, stress free, loving and caring boarding experience that assures your cat a home away from home. 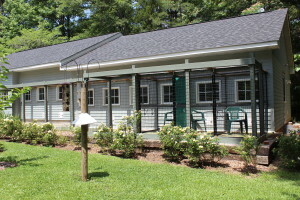 To serve the need for the Charlotte area and beyond for a facility designed exclusively for cats with their comfort and safety in mind.